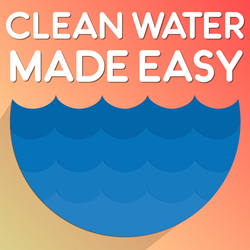 Clean Water Made Easy Podcast, a water podcast for home well water owners, is now available on iTunes. Each podcast includes step-by-step instructions on critical water quality issues for homeowners on well water. Clean Water Made Easy Podcast Goes Live! Clean Water Made Easy Podcast, a water podcast for home well water owners, is now available on iTunes and on the Clean Water Store website. Each podcast includes step-by-step instructions on how to produce top quality water for families or small communities using well water. The host, Gerry Bulfin, is a Master Water Specialist and certified by the Water Quality Association (WQA). Mr Bulfin is also a licensed California water treatment contractor. Mr Bulfin has been a member of American Water Works Association (AWWA) and National Groundwater Association for many years now and has over 25 years of experience in the water industry. "I look forward to sharing information on how to improve the water quality for home water wells", says Mr Bulfin. The podcast covers well water, well water treatment systems, and how to improve the quality of well water. Topics include discussion of iron in well water, how to remove bacteria, and how to do basic maintenance and inspection of home well water systems. Guests on the show will include well drillers, pump contractors and water testing specialists. Clean Water Systems has customers in all fifty states as well as over 40 countries worldwide. Their custom water treatment systems are used by the US government and various embassies and military bases worldwide. CWS is also in all states and national parks and has also donated many systems and worked on projects. CWS has supported water charities and church groups, small communities, hospitals, schools and mostly Mexico, Central South America and South-East Asia. Gerry has authored several instructional guides, books, eBooks, and manuals on various water problems and solutions. Some of these are sold on Amazon and some are provided to loyal customers when they purchase products. Copies of these guides will be provided free to podcast subscribers.